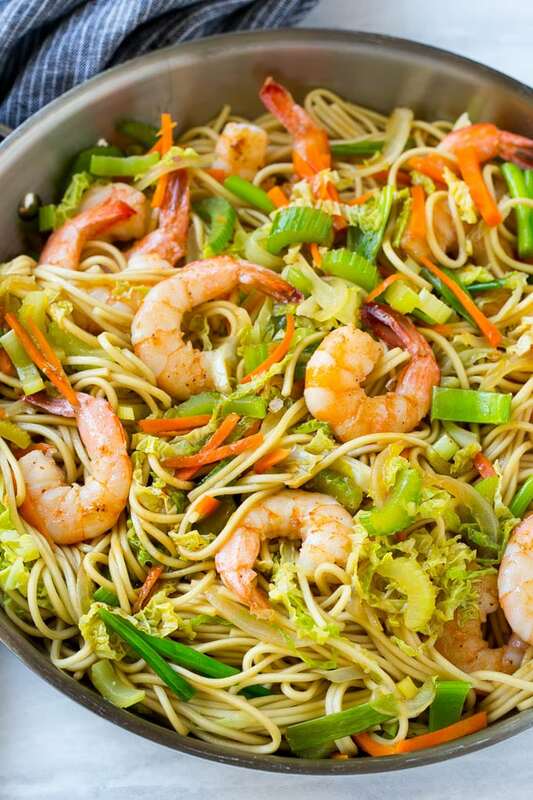 This recipe for shrimp chow mein is a quick and easy one pot meal with plenty of stir fried shrimp and vegetables tossed with noodles and a simple sauce. 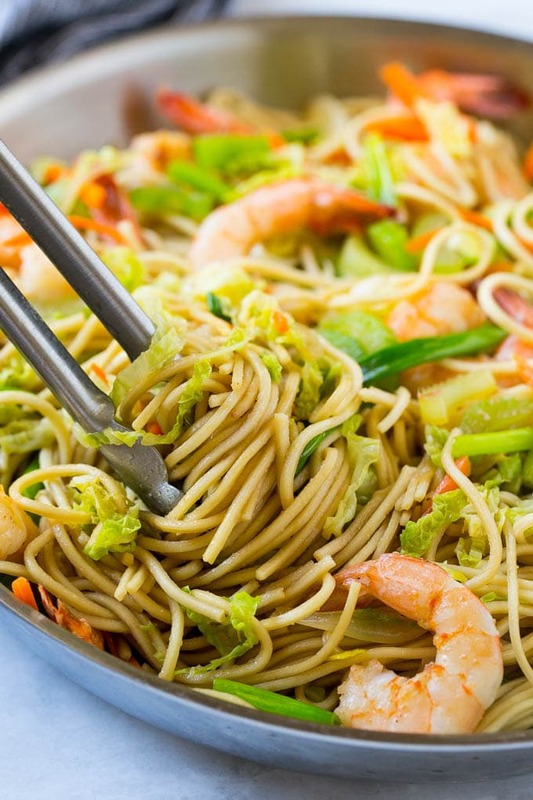 Shrimp chow mein is one of my favorite Chinese dishes! It’s great as a one pot meal, but if I’m feeding a big group I like to serve it with cream cheese wontons and sesame chicken. It’s one pot meal time again! You all know how much I love my one pot meals and this super easy shrimp chow mein is no exception. In fact, this may be one of my easiest one pot meals yet! It’s essentially a shrimp stir fry tossed together with noodles and a 4 ingredient sauce. If you’re not into shrimp you could absolutely substitute in cut up chicken and this dish would be just as delicious that way. But I love the shrimp, and my kids love the noodles so it’s a win-win situation all around. 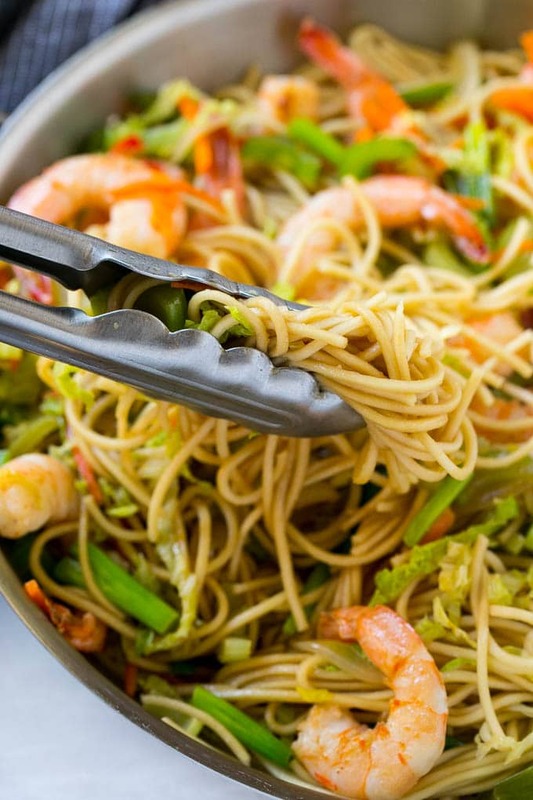 How Do You Make Shrimp Chow Mein? This dish uses pre-cooked yakisoba noodles. They sell packets of them at my grocery store near the tofu and wonton wrappers, which in my case is in the refrigerated area in the produce section. Since these noodles are already cooked, all you have to do is open the package, run hot water over the noodles to loosen them up, then toss them into the stir fry. It’s a huge time saver; dinner is ready in about 20 minutes, which is exactly what I need most nights. And that easy sauce I was referring to earlier – it’s just soy sauce, honey, ginger, sesame oil and garlic, simple right? 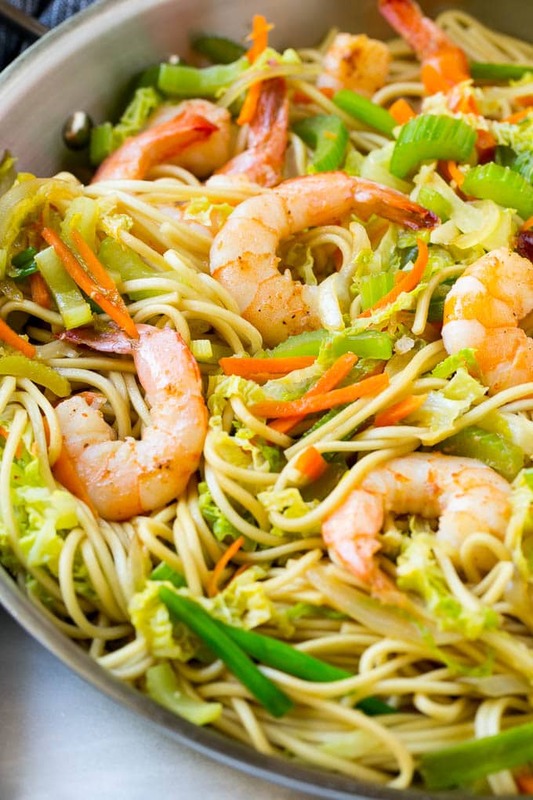 The beauty of this shrimp chow mein is that it’s easily customizable – you can switch up the protein and vegetables to come up with different variations that you know your family will love. I’ve started keeping packets of the yakisoba noodles in the fridge for those busy nights when I’m trying to put together dinner at the last minute – how can you go wrong with protein, noodles and veggies all in one pot?! Heat half of the oil in a large pan over high heat. Add the white onion and cook for 3 minutes or until onion has started to brown and soften. Add the carrots and celery, cook for 3-4 minutes until vegetables have started to soften. Add the cabbage along with 2 tablespoon of water. Cook, stirring constantly, until cabbage is wilted and cooked through, about 2-3 minutes. Season the vegetables with salt and pepper to taste. Remove the packets of yakisoba noodles from their package and run under hot water until you're able to break up the noodles, 1-2 minutes. Add the noodles to the pan with the shrimp and vegetables. Pour the sauce over the noodle mixture, tossing to coat evenly. Add the green onions and cook for 1-2 minutes more. This post was originally published on February 18, 2016 and was updated on August 19, 2017 with new photos. Simply fantastic!!! The only thing I added was a little oyster sauce… . My family loved it. Thank you!!! We have sesame allergies in my family. Is there a substitute for the sesame oil? You can just omit it! Why go out when you can make this yummy meal at home! Great dish! I love all those shrimp. This sounds really interesting, my hubby is not a huge Chinese fan, can I try to substitute the noodles to different ones? Picture looks yummy to me! Thanks! You could use any variety of long noodles, spaghetti would even work! When do you add the green onions? Oops I omitted that, just fixed the recipe. Thanks for letting me know! I used some left over angel hair pasta, came out great. Any idea on the calorie count on this….trying to track those on my diet.! This was wonderful! 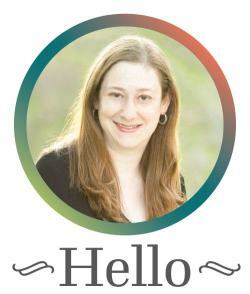 Definitely something I will be making regularly. My whole family enjoyed it, even the picky ones. I just love chinese noodle and shrimp and these look so good! I bet my kids would devour this. This recipe is going in my rotation this week! This is one of my favorite dishes to order for takeout – would be SO much better to make it at home! I’m going to have to hunt down those noodles – we love chow mein, and I need a fast and easy meal to throw into my rotation! This would be a huge hit in my house! It sounds really flavorful and I love all the veggies going on in there! This looks so good! I am not much for most seafood, but shrimp is an exception. I need to try this! 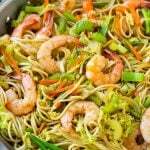 I love shrimps and chow mein, your version of this recipe sounds delicious and your pictures are beautiful.